During the period 1938 to 1961 Doug Waterhouse carried out pioneering studies on the sheep blowfly, a major pest. This work was interrupted by the Second World War where his attention turned to ways of protecting allied troops from the mosquitoes responsible for malarial transmission. By 1943 the repellent was widely deployed in the Pacific and Doug was considered a hero for his development of the repellent referred to by the troops as ‘Mary’. However it took the visit of Queen Elizabeth II to Australia in 1963 for the repellant to become a household name. Although the Queen was meant to be sprayed with the repellent at a garden party held at Government House in Canberra, the aide responsible lost his nerve and the Queen was left madly swatting flies. The next day was a different story, when Government House staff made sure the Queen was liberally sprayed before heading off for a game of golf. Journalists following the Queen noted the absence of flies around the official party, and word about CSIRO’s new fly-repellent spread. A few days later the good people at Mortein called Doug Waterhouse for his formula, which he passed on freely, as was CSIRO’s policy at the time. The rest, as they say, is history with Mortein’s Aerogard going on to become an Australian icon, ensuring that we all ‘avagoodweekend’. In 1938 Doug Waterhouse had been recruited by Dr Ian Mackerras to CSIR’s Division of Economic Entomology in Canberra, to work on the sheep blowfly problem. Over the next year or so he studied its physiology (in particular, digestion and excretion), ecology and population control. His research was a blend of the strategic and tactical. He addressed practical projects like fly dressings and burying carrion to reduce breeding sites. In addition he completed (with SJ Paramonov) a detailed taxonomic study which demonstrated the differences, both morphological and behavioural, between Lucilia cuprina and L. sericata (the English Sheep Blowfly). However within less than two years this blowfly research was interrupted by the start of the Second World War in 1939.
â€¦ Ian Mackerras enlisted the day that war was declared ‘ he was NX18, the 18th person from New South Wales. Having a medical degree, he went overseas as a medical pathologist. When he came back to Australia he was asked to set up a series of malaria control units, because at that stage Japan had come into the war and it looked as if Australia would be involved to the near north or further north. I volunteered to join these and was accepted, but interestingly enough the Army decided that the CSIR facilities at Black Mountain were far more extensive and appropriate, so it would be better for me to remain out of uniform and do research there. But when there was anything to be tested in the field, I would don uniform, be called up, and go out and use Army facilities. I believe this was an extremely effective way of using my abilities. To begin with, I was testing oils for spraying onto mosquito breeding grounds which are bodies of water ‘ oils which would spread very effectively, even though there might be surface films there already. I also had to test materials which might be used for mosquito sprays and housefly sprays to stop transmission of diseases. It was thought that our pyrethrum supplies, which at that stage came from Kenya, might easily be cut off, so it was a matter of testing any possible alternatives. It was particularly important to get a good mosquito repellent. Citronella oil had a reputation from earlier use in World War I and at other times in the Middle East, but when we tried it against mosquitoes in New South Wales it had almost no effect at all ‘ plenty of smell but a very short-lasting effect. I tested essential oils from many of the Australian trees, and one which proved to be an extremely effective repellent was from Huon pine, which is particularly common in Tasmania. The oil of Huon pine contains methyl eugenol and was used at that stage during grinding of lenses for telescopes and other optical equipment. The next step was to test it out in the field, but to my great disappointment half of the army volunteers became nauseated within about 10 or 15 minutes after it was applied to their face. The other half, including me, was totally unaffected, but it had to be dropped. For my tests I would sit in a large muslin cage in a room, along with a thousand or so mosquitoes, and have a substance on each leg, another one on an arm and so on. This work got into the press, and as a result we got many letters suggesting all sorts of materials and mixtures to be tested. As a matter of course I tested all of these and all of their ingredients. The Standard Oil Company wrote to us about two preparations that they had used in oil exploration in South America. One was dimethyl phthalate and the other was diethyl phthalate, and the company had about 35 per cent of these materials in two separate repellents. It so happened that, within our limited capacity to manufacture chemicals in Australia at that time, we could manufacture the phthalates. A friend of mine in Sydney, Herman Slade ‘ who now lives half his time in Vanuatu and half in Australia ‘ had one of the first stainless steel kettles and was making dibutyl phthalate. This was used as a plasticiser for the fabric of aircraft wings, to make them smooth and glossy. He made a series for me of these phthalates: dimethyl, methylethyl, diethyl and all the way up to dibutyl. I found that the diluted dimethyl phthalate was a good repellent but the pure dimethyl phthalate was quite outstanding. It gave protection against voracious mosquitoes for probably an hour and a half, under conditions as hot as you could get. So immediately I got in touch with a colleague, Captain Bob McCulloch, who tested it out under field conditions up near Newcastle, where there were hordes of mosquitoes, and it was equally effective. Major Mackerras dispatched us immediately up to Cairns, where at that time there was a lot of malaria transmission ‘ it has since been cleared up. We found the repellent just as effective against those malaria mosquitoes. The next stage was to test dimethyl phthalate out under conditions in Papua New Guinea which might be experienced if war came as close as that. So I was sent up to a little village at the mouth of the Lakekamu River, which is near the Fly River on the southern shores of New Guinea, where the malaria rate and the number of mosquitoes was the highest known at that stage in New Guinea. Most of the time, children there died from massive malaria mosquito bites; the inheritance of a degree of resistance from their mothers didn’t protect them except for about four or five weeks at the end of the dry period each year, when they could survive. By day, resting on the jungle floor you would find it absolutely peppered with these mosquitoes and, if at dusk you stood and waved a mosquito net round, you could collect one or two hundred mosquitoes every minute. It was really an excellent place for this sort of work. We didn’t know at the time whether or not the strain of malaria was Atebrin resistant. Fortunately, I took half as much again Atebrin as I needed. I became as yellow as if I had had jaundice, and I remember hearing Tokyo Rose saying over the radio, â€œDon’t take your Atebrin. If you go home you’ll not only be sterile but you’ll be impotent!â€ (This was the sort of attempt made by Japan to discourage the Australian troops from taking their Atebrin.) Anyway, I was protected even though I had probably well over a thousand bites from these malaria-carrying mosquitoes. The malaria strain was clearly Atebrin sensitive. The dimethyl phthalate, later called ‘Mary’, stood up under these conditions just as well as it had before, despite the ‘mights’ ‘ it might not have worked or it might have caused nausea or we mightn’t have been able to synthesise it. No, I did this myself. To expose yourself like this, there was a risk. There was a signal station on the other side of the river, but I was there with two entomological colleagues who had been doing work on malaria rates and who confirmed my experimental work. When I got back to Land Headquarters in Melbourne, Major-General Burston, who was the Director-General of Medical Services, Ian Mackerras and Bill Keogh, who was the Director of Pathology, were all sufficiently impressed that they gave very high priority to the production of this material. It then was used by the Australian forces, and I think later by some of the American forces, for the rest of the Pacific War, and it remains a very effective repellent. Yes, and normally you would have an entourage, or at least a staff sergeant. To go up into these areas, normally there’s nobody more senior than a lieutenant. Although at Headquarters captains were a hundred to a penny, out there a captain is really quite senior, and in the ship that I went on from Port Moresby to Lalapipi I found that I was by far the most senior officer. The captain of the ship was a warrant officer and they had some very battle-hardened troops from the Middle East, under the command of a sergeant. I remember we set off at midnight on a Saturday night and at 7 o’clock on the Sunday morning the captain asked me whether I was going to have a church service. I thought twice, beckoned the battle-hardened sergeant round the other side of the cabin and said, Look, you know more about this than I do. You’re going to come and tell me what orders I have to give you. So he went back and said, The Captain says we’ll have a five-minute church service. Now get busy. Later on, when they started on using their 303s to shoot sharks, I went round the back of the cabin and he came around to me; he didn’t ask me anything but just went back and said, The Captain says you’d bloody-well better stop that. So we got on extremely well. But I didn’t even have a staff sergeant. I didn’t have kitbags ‘because I had bottles of this, that and the other, and pipettes and measuring cylinders. I went around these parts with two suitcases. This made me look a bit peculiar, but I guess I was sufficiently peculiar that the troops didn’t mind me. In fact, after a while they got quite interested in what I was doing’ even though it was clear that I didn’t know much about fighting. By 1943 the repellent, referred to as ‘Mary’ by the troops, was widely deployed in the Pacific. Doug continued work on repellents until the end of the war and was considered a hero for his development of the repellent that protected Allied troops from malarial mosquitoes. During Queen Elizabeth II’s visit to Australia in 1963 Doug Waterhouse’s insect repellent was employed to protect her from the national pest, the Australian bush fly, during a round of golf. Journalists following the Queen noted the absence of flies around the official party, and word about CSIRO’s new fly-repellent spread. A few days later representatives from the company making Mortein insecticides called Doug Waterhouse for his formula, which he passed on freely, as was CSIRO’s policy at the time and the rest, as they say, is history. 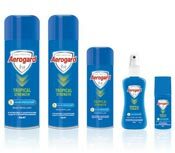 Aerogard went on to become an Australian icon, and is still in use today. It has been enormously successful and can be applied to skin, clothing, or other surfaces. It discourages insects and arthropods in from landing or climbing on the treated surface. During his illustrious career Doug received many distinctions and awards including: Commander of the Order of St Michael and St George (CMG) in 1970; Officer, Order of Australia (AO) in 1980; Fellowship of the Royal Society and of the Australian Academy of Science, and Foreign membership/Fellowship of the Russian Academy of Sciences (1993), the US National Academy of Science (1984), the USSR Academy of Science (1983), the Brazilian Academy of Science, the Royal Entomological Society of London (1972) and Gyotaku-No-Kai, Tokyo (1971).